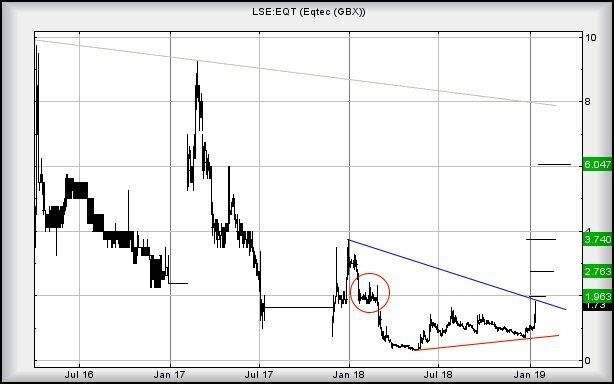 Eqtec #Nasdaq #CAC40 We last reviewed this mob (#Eqtec) just over a month ago (link here) and it has started movement with conviction. We’re a little surprised the price wasn’t dipped below 0.7 prior to movement but heck, who’s complaining. The future potentials remain quite interesting. Near term, there’s still the expectation of any increase above 1.83 reaching an initial 1.96p. This looks like it shall prove quite important for the longer term as despite a glass ceiling awaiting at the 1.96 level thanks to the circled area on the chart, closure above 1.96 should make future travel to 2.75 fairly difficult to avoid. In fact, with positive news flow, it could easily reach 3.75 without too much trouble. Any plot for movement beyond 3.75 is vague at best, due to a requirement the share price needs close above 3.3p, the high following its 2017 suspension. This is liable to prove difficult unless some miracle RNS is released. For now, we’re fairly happy and hope the increase is not being driven by “internet chatroom optimism” as this often ends in tears. However, it would require below 1.15p before we’d advocate panic!